August 17, 2018 Rev. Robert Moeller, Jr.
“Look carefully then how you walk, not as unwise but as wise, making the best use of the time, because the days are evil” (Ephesians 5:15–16). We shake our head and smile when we hear about that conversation. It is true that God works through common encounters. But how common can you get? Shouldn’t there be a certain degree of dignity to our conversations about the divine? Then we think back to Jesus’ conversations with the men that He was crucified with. Criminals. Hanging together on gore-stained trees. Mixture of sweat and spittle, buzzing flies. How much dignity could possibly be preserved in such a scene. But Jesus used the moment to invite one more into the Kingdom. In his letter to the Colossians, St. Paul writes, “Continue steadfastly in prayer, being watchful in it with thanksgiving. At the same time, pray also for us, that God may open to us a door for the word, to declare the mystery of Christ” (4:2–3). Little did Pete know that the “door” Paul was speaking of would on this day be attached to the stall of a men’s room. But such is the unpredictable nature of the Gospel. Such is the creative delight of a Father who loves His children. It seemed like a normal trip to the bathroom. But then God began to open a door. Pete discovered quickly that this young man was well-schooled in matters of religion. He had been raised in a Roman Catholic church and had attended a Catholic school, although he was not currently involved in any church. He was familiar with fairly advanced Christian teachings. He showed interest in life and death, in God and the church. He said his 43-year-old cousin had died recently and that had started him thinking. In fact, it had been troubling him. He had attended the funeral at an evangelical Christian church. The pastor had said some things during the funeral service which made him think. He was thinking still. “I’ve got a lot of questions,” he said. They talked some more, but their conversation had to end all too soon. “My name’s Eric,” the man said. “I’m Pete,” he replied. They shook hands. “Keep asking questions,” Pete said as Eric walked out of the room. I would call Eric an educated seeker. He would probably call himself confused. He has a lot of information, but he hasn’t quite made sense of it all. His mind continues to probe, to question, to poke at the Infinite. Pete will probably never see Eric again or find out for sure if he has saving faith or not. But that’s okay. God hasn’t asked us to pick out the saved from the unsaved. That’s His job, not ours. He has simply told us to be faithful. He has asked us to stand as a clear witness to the person and work of Jesus Christ. St. Paul writes in our text, “Look carefully then how you walk, not as unwise but as wise, making the best use of the time, because the days are evil” (Ephesians 5:15–16). In order to win those who are outside the church, we Christians are to be very prudent in all our actions and speech. We are to live not as fools but as wise. We are not to drift along without forethought and plan, but to give serious thought upon the ways and means by which we may help to build the Kingdom of God and advance the cause of Christ. We are to look for the opportunities God lays before us to confess our Christian faith. The time may not always seem favorable or convenient, but it is of utmost importance that we make the best use of the time we have to share the Gospel. Because the days are evil, Christians are not to become foolish. We are not to allow anything to cloud our minds, but to think carefully about exactly what, at this time, in this place, may be the Lord’s will. All this is important for all circumstances, but especially in relation to our behavior or conduct toward non-Christians with whom we live or come in contact. Once again in this week’s text, we have a struggle between our old and new natures, between sinner and saint, the wise and the fool. Remember, we still live in the devil’s time, where he is free to roam the earth and wreak havoc and destruction. We battle with the ways of the world and wrestle with our own sinful nature. But Christ Jesus “gave Himself for our sins to deliver us from the present evil age” (Galatians 1:4). Baptized into His death and resurrection, we receive the rescue from sin, death, and the power of the devil that Christ won for us on the cross. We have a new life no longer focused on ourselves, but on Christ in which the possibilities of serving Him are many. So we make the best use of our time. St. Paul encourages us to “be filled with the Holy Spirit.” Note that this verb is passive; it is not something we do, but is done for us. As we hear and read God’s holy Word, and receive Holy Absolution and Christ’s body and blood, we are filled with the Holy Spirit. What a great comfort that is for us! Living as wise ones is not something in which we are left to ourselves to do. Rather, in Christ we are given the means by which God keeps us in the one true faith—His Holy Spirit. The Holy Spirit is the impelling, directing power of our Christian life. It is the Holy Spirit living in us who gives us the power, ability, and willingness to walk in the light, to avoid—and even confront—the works of darkness, and to seek to know God’s will. The Holy Spirit motivates and enables us to make the most of every opportunity to share the Good News of Jesus Christ. You see… Eric is not the only one who is searching for the truth. People like Eric walk in and out of our lives every day. A search for the spiritual seems to have taken on a new urgency. The next time you walk through the mall, look for items which have spiritual themes. Angels everywhere. Countless books on spirituality, providing worldly advice on how to find inner peace. Look at social media and see how many people are requesting prayers or seeking spiritual guidance. Many people today are struggling to synthesize a religion that makes sense to them. But they are the first generation in America’s history, which is not using Christianity as a starting point. Instead, the majority of them are creating a belief system based on social justice and New Age religion. Throw in a little Catholicism and Mormonism. Add some Protestantism and sprinkle a little Islam on top. Call this Christianity, because we’re a Christian nation, right? It all makes sense and all hangs together fairly well. But it’s a far cry from biblical Christianity. At first glance, we might become discouraged. But take a closer look at the world around you. Think then of Jesus’ words to His disciples: “Look, I tell you, lift up, and see that the fields are white for the harvest” (John 4:35). We have an incredible opportunity before us. Consider, for example, those who are creating their own religion. Although they are starting from a non-Christian base, the important thing is that they are interested in spiritual things. Thank God they are searching! Yet we must remember that the harvest doesn’t just happen. A field has never harvested itself. The present harvest involves us more intimately than we might like to think. Remember how Jesus talked to His disciples about this very thing. He said, “The harvest is plentiful but the workers are few. Ask the Lord of the harvest, therefore, to send out workers into His harvest field” (Matthew 9:37b-38). And Jesus’ very next action was to send them out. They were to make the best use of the time left to share the Good News of the kingdom of God. So, how does God prepare the workers for the harvest? How does He bring us to the point where we willingly step out into the fields? I believe that He starts at the cross of Calvary. God has given up everything for the sake of those whom He loves. The King cancels the enormous debt the servants owe Him. He writes the letters P-A-I-D across the details of our ledger sheet, not with black ink, but with scarlet red letters, scrawled out in blood. The blood of His own Son. We read in 1 Peter 3:18, “For Christ died for sins once for all, the righteous for the unrighteous, to bring you to God.” The unrighteous have nothing to offer. They merely receive the gift from the Righteous One. Any understanding of our actions to reach others must, therefore, begin at the cross. Our lives are lived in gratitude to the King of Righteousness who covers us with His righteousness. It is entirely natural for us to want to share us Good News! Step out the doors of this church and you’ll find a whole world of mission fields white for the harvest. There are all sorts of souls to be won for the Lord. You never know where you might find them. It might be over the door of a bathroom stall. It might be one of the students at Vacation Bible School. The visitor who came to the Community Block Party or Friendship Saturday… But chances are your mission field is much closer to home—maybe even in your home. Step out the doors of this church confidently, making the best use of the time that is left. Filled with the Holy Spirit in Baptism and through God’s Word, fed by Christ’s body and blood, you are motivated and equipped to share the Gospel of Jesus Christ, the Son of God, who lived the perfect life we could not live, who died on the cross to pay for our sins, who rose triumphantly on the third day and who is now interceding at the Father’s right hand on our behalf. Go in peace and serve your fellow man with joy. You are forgiven for all of your sins. August 10, 2018 August 10, 2018 Rev. Robert Moeller, Jr.
“Therefore be imitators of God, as beloved children. And walk in love, as Christ loved us and gave Himself up for us, a fragrant offering and sacrifice to God” (Ephesians 5:1-2). Of course, it’s a good time of the year to be an adult, too—and largely because it’s such a great time for children. I love watching kids at play, at the pool, tee ball, family vacations, Vacation Bible School, just interacting with each other at home when they’re not tied own with homework. It is interesting to watch children interact, isn’t it? Sometimes they cooperate with one another so well, sometimes not so well; they’re sinful just like everybody else. What makes children get along with one another? We’d like to find the formula, wouldn’t we? At VBS this week, I had the opportunity to observe this dynamic firsthand. We were playing a game in which teamwork and cooperation are very important. It was interesting to see how some of the teams worked well together and others did not. Some got so frustrated with their teammates that there were some hurtful words and hurt feelings, so we had to deal with that, too. After the games, we talked about what had happened. I asked the kids what they thought had made it possible for them to win and what had happened when they didn’t win. They agreed that it all came down to teamwork. When they worked together, they succeeded; when they did not, they got frustrated with each other and things just got worse. Cooperation is the key to any group efforts. As with most things, I suppose, when it comes to raising children to cooperate in wholesome ways, there are the two extreme views. There’s the permissive approach, and there’s the strict, authoritarian approach. Wise parents, though, are looking for something in between or a combination of both. Our heavenly Father is the wisest parent, and in our text this evening, our loving Father teaches His children how to get along, avoiding either extreme, but drawing from the strengths of both approaches—permissive and authoritarian. We are children of God! Children of the heavenly Father. All of us, at every age. In fact, we are sealed as His beloved children. God did that in Holy Baptism. Baptism is the visible act by which God put His seal on us. It marks each one of us—both on the forehead and on the heart—as His child. By that act, God also takes responsibility for raising us, for teaching us those things a parent teaches a child. 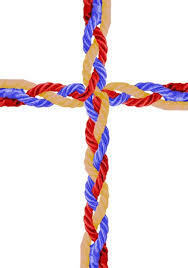 Like how to get along with one another, especially our brothers and sisters in Christ, the rest of God’s children. Just like kids, we sometimes get along well, sometimes not so well. Except that the older we get, the more our squabbles become these: Destroying someone’s reputation through gossip, rather than shouting over who gets to bat first. Fighting for a job the other person wants, rather than for a seat next to the window. Making sure we get our way in the voter’s assembly no matter what it takes, rather than insisting we should be the captain because it’s our ball. Soaking each other with verbal abuse, rather than mere water that actually feels pretty good on a hot day. That kind of behavior is no more acceptable among adult Christians than it is among kids at Vacation Bible School. As Paul writes: “That is not the way you learned Christ!” (Ephesians 4:20). God intends in our text to lead us to a better kind of interaction. Every parent’s dream—isn’t it?—is children who are kind and forgiving of one another rather than bitter and angry. How can parents make that happen? How does God make it happen in us? Our Father has His dos and don’ts for getting along. Remember that extreme permissive approach? The parent lets the child learn on his own how to get along. The idea is that independence lets the child develop his or her creativity to the fullest. Unfortunately, children in such totally permissive homes often develop an egocentric, “me first” view that leads to greed, covetousness, and bullying. What’s more, children in such environments often develop resentment for parents who don’t seem to care enough to provide guidance. God certainly does not take this kind of laissez-faire, “anything goes” attitude with His children. He cares. In fact, when His children sin, He grieves (4:30a). The Holy Spirit is described as like a parent. He is the one who teaches us God’s will. And He grieves when we ignore it. The Holy Spirit is the one who shows us God’s love. And He grieves when our lives don’t reflect that love. Imagine the grief a parent feels when a son or daughter hurts someone else’s child, maybe commits violent crime. Imagine the grief a parent feels when a child rejects everything a parent has done for him, storming out of the house at age 18, vowing never to come back. Imagine the grief a parent feels when she sees a child go the wrong way in life, perhaps destroying herself with drugs or alcohol or unchristian relationships. The Holy Spirit is grieved when God’s children hurt one another. The Holy Spirit is grieved when we reject everything God has done in creating, redeeming, and caring for us. The Holy Spirit is grieved whenever we hurt ourselves and others by falling into sin. God cares about us too much to sit back and see whether we’ll learn how to get along. He doesn’t take a “boys will be boys” or “children will be children” attitude when Christians hurt one another. No, He commands: “Let all bitterness and wrath and anger and clamor and slander be put away from you, along with all malice. Be kind to one another, tenderhearted, forgiving one another, as God in Christ forgave you” (4:31-32a). God has His dos and don’ts for getting along. It is completely inconsistent with Christian faith for believers to fight, carry grudges, talk evil about other believers. God does not permit it! God commands His children to be kind and compassionate and forgiving. God commands His children to care about the hurt others are feeling at the death of a loved one. God commands His children to support others who are feeling weak when life seems to be going wrong. God commands His children to bear with others’ sins and failures. God is no permissive parent. We could never resent Him as a Father who doesn’t care. He longs, He aches, for us to be kind and compassionate to one another. By His commands, He actively teaches us to get along. Still, you can’t compare Him to a parent of the other extreme approach, a strict authoritarian. Our Father uses a lot of love in getting us to get along. The Gospel is the only motivator that generates true change of heart. Paul writes: “God in Christ forgave you. Therefore be imitators of God, as beloved children. And walk in love, as Christ loved us and gave himself up for us, a fragrant offering and sacrifice to God” (Ephesians 4:32b-5:2). You know the authoritarian model. Lots of rules. “Do it because I said so.” If you don’t listen to me, you’re going to get it.” This approach gets outward compliance but inner resistance, often resulting in even more resentment than the permissive model. So as soon as the threat is gone, even the outward compliance stops. God doesn’t want grudging outward action. He wants hearts. So He brings about loving outward action by working inwardly, working in our hearts. He showers us with huge doses of love (5:1). He calls us His children, His dearly beloved. And He proved that that’s exactly what we are to Him when Christ sacrificed Himself for us (5:2). That’s the greatest demonstration of love, isn’t it?—giving up one’s own life. Jesus died on the cross because God loves us. God wanted us to be His, to be His children, children who would serve Him and one another willingly. That could only be possible if He removed the sin that separated us from Him and from one another. That’s what Jesus did by dying and rising again. Paul says Jesus gave Himself up as a “fragrant offering and sacrifice to God.” That recalls the Old Testament sacrifices—the smoke of the burnt offerings being sent up to God as a pleasing aroma. Let your nostrils imagine the pleasure of breathing fine incense. Nothing the Old Testament people or we ourselves could present could please God like that, but Jesus pleased God for us. He was God demonstrating His love for us. Christ’s pleasing God for us is why we could be “sealed for the day of redemption.” Once Christ had paid for the sins of the world, the Holy Spirit could come to us in Baptism and give us the forgiveness Jesus earned. The seal means we can certain of eternal life when our last day comes. Baptism, eternal life—that’s God demonstrating His love for us. That love then teaches us to love; we imitate God’s love (5:1). The Greek word for “imitator” gives us our word “mimic.” That’s the way children learn, isn’t it? Children mimic their parents. They walk the way Dad walks. Talk the way Mom talks. Children who live in a loving home see how it’s done. Dad saying sweet things to Mom, spouses helping each other around the house—it rubs off. God uses that technique on us, teaching us by example how to get along. He wants us to love, so He first loved us richly. He wants us to forgive, so He shows us how by first forgiving us. Even more important, God’s love and forgiveness motivates us to love and forgive and get along. A child who lives in a house of ill will not only won’t know how to love, but he also won’t want to. The anger he’s received will be anger that has to come out. But a child who grows up in a loving family wants to be nice to other kids, wants to love other people, know how to love other people. We Christians are all growing up in the most loving family. In spite of all our sins, we’re loved. In spite of our unworthiness, we’re blessed every day. In spite of our “bitterness and wrath,” “anger,” “clamor,” “slander,” and “malice,” all who believe have eternal life. That kind of love moves us to get along nicely, even if we’ve long outgrown summers off and the backseat of the family car. “Therefore be imitators of God, as beloved children. And walk in love, as Christ loved [you] and gave Himself up for [you], a fragrant offering and sacrifice to God.” (Ephesians 5:1-2). You are forgiven for all of your sins. This sermon is based upon a sermon outline by Rev. Carl C. Fichenscher II, published in Concordia Pulpit Resources, Volume 22, Part 3, pg 43-45.